On Thursday 14th March 2019, Irish Ferries’ newest ship, the W.B. Yeats, will commence her Dublin-Cherbourg schedule. Neil Steedman, ITTN’s News & Features Editor, took a day return sailing on her to Holyhead to report on what she has to offer. Beautiful brides are fashionably late but are usually worth waiting for – and so it has been with Irish Ferries’ W.B. Yeats. The company would, of course, have preferred its newest ship to have been delivered on time last summer but, finally, since 22nd January 2019 she has been operating two return crossings per day on the Dublin-Holyhead route – and will transfer to the Dublin-Cherbourg route in just over two weeks’ time. The €150 million, 55,000 gross tonne vessel has a total capacity of 1,800 passengers and 85 crew, along with a maximum of 1,216 cars on 3,500 lane metres on vehicle decks – or 300 cars and 165 trucks. With a speed of up to 22.5 knots (25.9 mph), the W.B. Yeats will be able to sail from Dublin to Cherbourg in 20 hours (faster than the company’s previous Rosslare-Cherbourg service), and from Cherbourg back to Dublin in 18 hours 15 minutes. Passenger facilities on deck 10 include Reception, the Innisfree Club Class lounge, á la carte (Lady Gregory) and self-service restaurants (Boylan’s Brasserie and Café Lafayette), a choice of bars and lounges, including The Hazel Wood quiet lounge for reading, extensive duty-free shopping at The Shop, The Abbey and The Peacock cinemas, the Sally Gardens Kids Room, Crazy Jane’s games room (over 18s only), and, on decks 10 and 11, The Wild Swans restaurant and lounge exclusively for freight drivers. While the exterior of the ship is brilliant white, the interiors are primarily varying shades of grey, complimented by a variety of muted colour tones – except for the Sally Gardens Kids Room that embraces strong reds and oranges. There is free wi-fi throughout the ship – with the catchy password of ‘shipahoy’! …and, yes, ‘gifts from Ireland’! Passengers can upgrade to Club Class for €18 (£16) per passenger and thus get the ‘best seats (and tables) in the house’ – in the ship-wide lounge at the bow on deck 10 – along with priority vehicle boarding, exclusive lounge bar, complimentary drinks and snacks, and up to 25% off selected items in the duty-free shop. This is definitely a case for ‘We deserve it!’. The Club Class lounge is also fitted out with numerous three-square-pin sockets (see comment below under Cabin Choices). The top deck 11 provides The Maud Gonne lounge bar and, outside, a close-up view of the striking green funnel and sea views, as well as the Drumcliffe Promenade with some fixed tables and chairs (if/when the weather permits! ), and some smoking areas for passengers who cannot survive the non-smoking regime on all other decks. 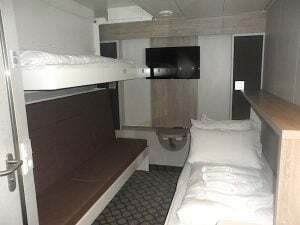 There are 440 en-suite air-conditioned passenger cabins on decks 8 and 9, including luxury suites with their own private balconies and four wheelchair-accessible cabins. ITTN’s cabin on deck 8 presented as a compact but neat one-berth cabin with a sofa and window, but the sofa converts into another bed and two more swing down from the ceiling to make it a four-berth cabin. By the way, cabins do not currently (no pun intended!) have three-square-pin sockets, only two-round-pin sockets, so passengers should be advised to bring an adaptor (or two) with them. Reception advised that cabins will be supplied with adapters, but that will be inviting more than a few to ‘go astray’. No doubt Irish Ferries will address this issue before too long. , Medium for €45 (70cm high, 75cm wide and 95cm deep), and Large for €60 (100cm high, 75cm wide and 95cm deep). It is recommended that passengers bring a comfort blanket or bedding for their pet along with a water bowl. Adults are allowed to visit their pets during the crossing and bring them for a short walk. A crew member will accompany them to the kennels at visiting times displayed at the reception desk. Early pre-booking of pets is essential and is subject to space, availability and terms & conditions of the Pet Travel Scheme, the Government-controlled system that allows movement of dogs, cats and ferrets within EU Member States without quarantine restrictions – but they need a Pet Passport. ‘Sight’, ‘Hearing’ and ‘Feeling’ dogs are welcome onboard and must also be Pet Passport compliant. A kennel should be booked for each crossing and contact made with disabilityofficer@irishferries.com to notify the exact nature of the disability. The dogs are allowed to remain with their owner on the passenger decks for the duration of the voyage if they are officially registered working dogs.